All together now. Watch movies, shows, live TV, YouTube, and photos streaming on your TV from all your familys devices. Stream from your phone to TV. Just like that. Works with the streaming apps you know and love. Start streaming with just your voice. Upgrade your TV for less. Expand your home entertainment without buying a new TV. Its so affordable you can get one for every TV in the house. 1 Subscriptions are required to view some content. 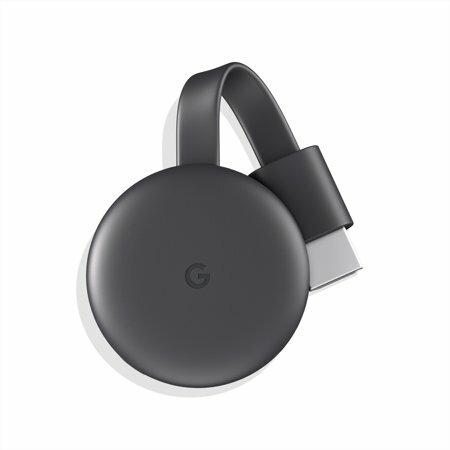 2 Google Home, Chromecast, and compatible content required to cast to a TV using Google Home. I absolutely love this device! It makes watching videos, movies and shorts clips from your smart phone and tablet a fun family affair. We spend more time watching things we cast than cable lately. It is easy to set up and you can use multiple devices in the same home. We have three in our house. It cast almost any video online from phone. Yes, having wifi is a plus if your on a limited plan with your phone. The speed and picture quality of streaming is very good. Even with Hulu Ultra, WWE and Netflix, it still saves me hundreds every year vs. cable. So, you don't think you need a Chromecast? I never really gave much thought to a casting device for my tv. I do most of my tv viewing and music listening on my computer. I'm really glad I got this because now I can cast from my computer on to my living room tv and enjoy the sound on my home theater system. The quality is amazing both visually and audio. I love it. It worked flawlessly and turned my TV into a streaming video platform. Works with YouTube TV, Netflix and other services. I cut the cable and satellite and use wifi to watch programming now. Not as good as a Chromecast (Visio) TV , but allows any TV to receive Chromecast broadcast via HDMI port. The installation was very easy, just as the advertising says. Just plug into any available HDMI port and the power cable into any USB port hanging around. Most recent TV's have plenty of spare ports. If you need to use the power supply you will need to use your own USB/mini USB cable because the included one probably isn't long enough. Just plug in the stuff and follow the onscreen instructions to log in to their website and continue from there. It will find your wifi network and walk you through the connection. The only downside may be that you need to use your phone as the remote. This may or may not be inconvenient depending on how you use your phone. Otherwise, all good, good resolution and sound. I travel a lot and hoped to take this with me to cast shows from my laptop. Unfortunately, it is not easy to switch this product from TV-to-TV or wifi-to-wifi. They advertise it can be set up through your laptop or desk top. As stated in other reviews, that is not true and the only way to set it up is through your phone. AFTER you buy it and call their support hotline they will tell you that it needs to be set up through the phone. When you ask how to set it up through your laptop they simple run you in a circle and tell you to unplug it and plug it back in. When you ask for a supervisor they tell you one isn't available.